Disney World is like a little country, tucked away in the middle of Florida. Just like any country, it has its own language and customs. If you are a repeat customer, know the vocabulary, and use the terms, then this is fine. But it is not so great for first-timers who visit and have not received the memo. Here's a typical example: "We are staying at the AKL with the DDP. We have ADRs in the MK, and plan on park hopping." Here's a translation: "We are staying at the Animal Kingdom Lodge with the Disney Dining Plan. We have Advanced Dining Reservations in the Magic Kingdom and want to visit more than one park each day." Learn some of the most common terms and abbreviations you may hear about Disney World, visiting the parks, or staying in the resorts. These abbreviations are used throughout the parks and resorts and appear on official Disney maps, too. MK, DAK, EP, or DHS: The most popular park, the one featured in most photos of Disney with Cinderella's castle in the backdrop is, Magic Kingdom, or "MK." The other parks also get abbreviations, too. "DAK" is Disney's Animal Kingdom, sometimes it's just "AK"; Epcot is "EP"; and Disney's Hollywood Studios is "DHS." Hollywood Studios used to be called "MGM." When the park opened in the '80s, it was a theme park and a production studio with licensing rights from Metro-Goldwyn-Mayer one of the world's oldest film companies. The Mountains: The "mountains" is the term for the major roller coasters in Disney that include Splash Mountain, Space Mountain, Thunder Mountain, and more. Water Parks: The two water parks in Disney World are Blizzard Beach and Typhoon Lagoon. Disney Springs: If you want to get a taste of Disney, but do not want to pay the entrance fee at the gate, you can stop in at Disney Springs (sometimes called downtown Disney). It is the shopping, dining, and entertainment district that does not require a ticket to visit. Park Hopper: If you plan to visit all the parks and you want the flexibility of coming and going between the parks, you might want to consider getting the "park hopper" pass, which is an optional add-on to your ticket. You can "hop" to and from more than one theme park per day. Ticket and Transportation Center (TTC): You can plan on using the ticket and transportation center, which is Disney's monorail, tram, and bus transportation hub to get around. 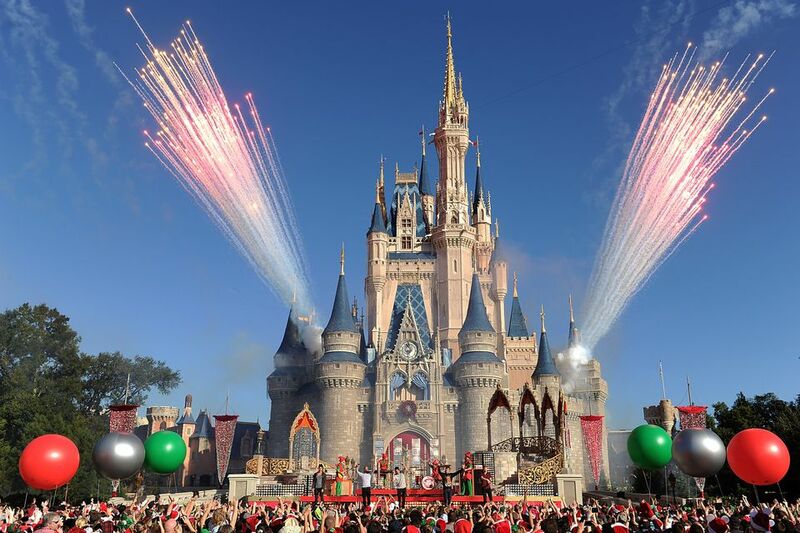 Magic Your Way: Disney wants you to be able to customize your Disney vacation to your liking. So, picking the parks you want to visit when you arrive for your vacation (instead of months in advance) is called "Magic Your Way." It is a general term that allows you to choose just the options you want for your visit. Annual Pass Holder: If you live near Disney, have young kids, or want to visit Disney several times a year, you might want to consider buying an annual pass. It is a ticket that is good for park entry any day of the year and is a good value if you visit Disney World frequently. On Property: When talking to a travel agent, you may be asked if you want to stay "on or off property," which means, do you want to stay at one of the Disney resorts. "On property" also includes the parks. Advanced Dining Reservations (ADR): Most restaurants at Disney World book up fast. If you book your vacation months in advance, and you know you want to go to a certain restaurant for a chance to see Mickey and friends, then you might want to get "advanced dining reservations." Restaurant reservations can be made up to 180 days in advance. Quick Service (QS) or Table Service (TS): If you are looking to grab a meal without the hassle of a reservation or being formally seated for dinner, you will want to eat at a "quick service restaurant," which is like a fast-food dining location, also called "counter service restaurant." On the contrary, a "table service restaurant" is a traditional sit-down restaurant in Disney World where reservations (ADRs) are essential. Character Dining: "Character dining" is the term for restaurants that have Disney characters who stroll around the restaurant visiting at tables while you enjoy breakfast, lunch, or dinner at special locations within a theme park or resort. Disney Dining Plan (DDP): The "Disney dining plan" is a pre-paid Disney meal program. Depending on your needs and appetite, this plan can save you a lot of money on food at the parks. Resort Mug: If you are staying at one of the Disney resorts on-property and do not get the dining plan, you can still opt to get a "resort mug," which allows you to purchase a refillable mug at any of the resort restaurants and use it for free refills on soda, tea, and coffee at the resort for the duration of your trip. Extra Magic Hour (EMH): Staying at a resort comes with a few other perks like free parking, transportation, and extra magic hours in the theme parks. An "extra magic hour" grants you usually an extra hour before or after the parks open or close. This is a key perk for Disney resort guests. Magical Express: Another resort perk is the use of the Magical Express buses, which are a free airport shuttle for Disney resort guests. MagicBand: When you stay at one of the resorts, you will be issued a MagicBand. It is a colorful, waterproof wristband that you wear throughout the duration of your stay at your resort and through your visits to the parks. Programmed into the MagicBand is access to your hotel room, access to the parks, and much more. Disney Vacation Club (DVC): For frequent Disney travelers, you may consider looking into the Disney Vacation Club. It is the Disney time-share program that features deluxe resort accommodations and perks. FastPass+: Historically, Disney World has been known for its long lines for rides. To improve upon this experience for guests, Disney initiated the FastPass+ service, which will help you spend less time waiting in line. You can select your rides and ride times in advance, which helps you enjoy more of the park with less of the waiting. Child Switch Program or Rider Switch Program: If you are traveling with small children and each of the parents would like a turn on the rides after waiting on a line, you can use the Child Switch Program. Ask for a child switch ticket at the ride entry point. Disability Access Card: Guests with disabilities should go to Guest Relations, which is at the main entrance of all the parks. You are eligible for a Disability Access Card (formerly called a Guest Assistance Card). This service will allow you a return time for attractions based on the current wait time. As soon as you finish one attraction, you can receive a return time for another. Single Rider Line: Another way to skip some lines is if you are a single rider. A single rider line is a special line at select attractions that is used to fill up seats on some rides. This line moves very quickly. Photopass: When you visit Disney World, you will see professional photographers stationed at key locations throughout the parks. Photopass is great if you want to capture a nice family photo together. It costs nothing for a photographer to snap your photo. If you decide to buy the photo or digital photo file, that's the only time you'll pay. Some of the main events at the Disney theme parks are the fireworks shows and parades. You may sometimes hear them called by their names, it might be a good idea to know which is which. If you are at Magic Kingdom, the fireworks show is called "Happily Ever After," it was formerly known as "Wishes." It closes the evening at the Magic Kingdom. At Hollywood Studios, "Fantasmic" is a theatrical show coupled with fireworks. You are seated in a giant amphitheater to watch the entertaining 30-minute production. It usually has two showings once the sun goes down. Epcot's fireworks show is viewable from most parts of the park and it's called "Illuminations." If it has been a few years since you last visited the Magic Kingdom, then you might be surprised that the "Electric Light Parade" has been discontinued. The ELP, as it was sometimes called, had been a historic mainstay of the park for decades. From time to time, it has a special encore performance for a limited time. There are a few attractions that you may hear people talking about with some frequency like the Bibbidi Bobbidi Boutique, or "BBB," the magical princess makeover store at Magic Kingdom, and Toy Story Mania, one of Disney World's most popular rides at Hollywood Studios. Other top things to do while at Disney included collecting character autographs from Mickey and friends in all the Disney parks. As keepsakes, you might want to get pins for Disney pin trading, which are collectibles that are fun to display and exchange with friends. A newer type of collectible is Vinylmations, which are small, Mickey Mouse-shaped vinyl figurines that are fun to collect or trade.